Google unveils their streaming service that will launch later this year, classic Call of Duty multiplayer is coming to mobile, My Time At Portia is arriving on consoles in April, Castle Crashers Remastered confirmed for the Switch and PS4, Casey Hudson addresses the criticism of Anthem, and new releases for the week. A new challenger has appeared! 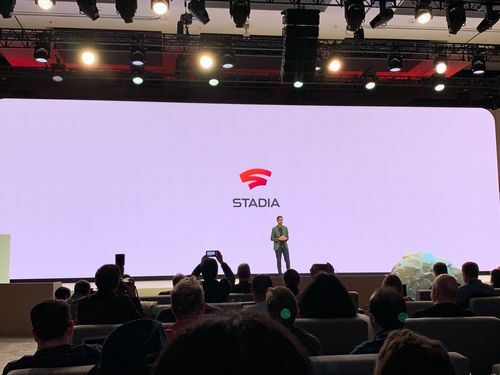 Sundar Pichai, CEO of Google, took to the stage at GDC today to announce the company’s anticipated foray into gaming titled Stadia. This project has been one of the worst kept secrets as rumors have circulated that Google was entering the gaming space. Turns out we already got a little taste of Stadia last year when Google invited users to Project Stream to run Assassin’s Creed Odyssey from a Chrome browser. The fact that the beta was essentially a test of what Stadia would be is not surprising but the feedback was generally very positive. With the Google Data Center being able to support over 200 countries in 19 regions and 58 zones, they have quite a bit of power. Stadia is strictly a streaming service and not coming in a big box as it can be played from Chrome on PCs, laptops, TV’s, tablets, and phones. Essentially, it seems just about any device that can run Google Chrome can run Stadia. One of the more impressive features was shown during the keynote that while watching an Assassin’s Creed Odyssey video on Ubisoft’s official YouTube channel there was a link to play the actual game. Google says that the time between clicking the button and being put into the game is five seconds or less. This feature can be done with other games in the service but it is not clear if these links to play games you’re watching are only on the game’s official developers/publishers channels. Just how will you control these games? There are a couple of options, and chances are you already have one of them covered. Firstly is that Stadia will support current USB controllers along with mouse and keyboard. While not specifically mentioned, the graphic during the Stadia announcement showed controllers that very much resembled the DualShock 4 and Xbox One controller. Keep in mind this is for playing Stadia on a laptop or PC. As you might have guessed for the second option, Google is making their own controller for Stadia. The look is something of a cross between the Xbox One and DualShock 4 with the shape similar to an Xbox One controller but the analog stick placement in line with Sony’s DualShock 4. Not just a simple controller, the Stadia controller connects via Wi-Fi directly to the game you are playing in the data center. There is a share button that can be used to, well, share experiences to YouTube and oddly a Google Assistant button that when pressed allows the user to use the built-in microphone and ask for help. During Project Stream, AC Odyssey could be streamed at 60fps 1080p, which sounds pretty good over a browser. Stadia ups the ante with 4K resolution, 60fps, and HDR surround sound support. The scary part is Google states that in the future they will be able to stream at 8K resolution with 120fps. Google is also promising that while you the player are streaming a game, there is a simultaneous stream going on at the data center that you can share onto YouTube at 4K 60fps. So if you’re not able to stream in 4K due to bandwith restrictions, at least the gameplay you share will be at the highest resolution. You’re probably reading this and going, “what the hell do you have to power this?” Google is partnering with AMD to create a custom GPU along with Google’s own custom CPU to provide over 10 teraflops of power in a single Stadia instance. Compared to the PS4 Pro and Xbox One X, Stadia actually is more powerful than both combined. The PS4 Pro supports 4.2 GPU teraflops and the Xbox One X has 6 GPU teraflops. Stadia is running Linux OS with Vulkan. Epic’s Unreal Engine, the Cry Engine, and Unity are onboard as supported engines and partners for Stadia with the list continuing to grow. These are important as Google is also directing developers to make their games through Stadia whether it be on their desktop, their own cloud, or Google’s cloud. DOOM Eternal is one of the year’s biggest titles and on the stage it was confirmed that the sequel will be coming to Stadia with full 4K and 60fps support. Since it is one of the hot topics of the industry, Google came out immediately by saying that Stadia will support full cross-platform play. The option falls to the developers to enable cross-platform multiplayer and even saves from other platforms. Google is taking a stand for co-op play with something they call Stream Connect. Each screen would be powered by a single Stadia instance which results in no drop in performance on the graphical side. Google even states that developers can enable players to pull up the views of teammates. Think of a squad-based game such as The Division or even PUBG and just being able to see what your squad sees has serious potential. Further targeting developers to Stadia is Style Transfer ML, a tool that makes putting that little taste of style onto a game much easier. Shown on stage was a tech demo where different takes on style were shown and applied instantly. Even Pac-Man can be a style if you so choose. Dylan Cuthberg took to the stage to share something Google is calling State Share. Allowed by the developers if they choose, players can share a “playable moment” that could include the world state, player’s position, and even inventory. It more or less sounds like traditional save states but ones that can be accessed instantly either through e-mail or YouTube. YouTube is still a thing for live streaming games and Stadia could make that an even more attractable platform with a feature called Crowd Play. This allows content creators (streamers) to allow their audience to play with them as viewers can que up to play in the next match or session. There will be tools that allow creators to tweak settings how they see fit. Google will be pulling in a lot of different games from several developers onto their platform, but they’ll also be committing to exclusive experiences on the platform with the newly announced Stadia Games and Entertainment. Leading this new group is Jade Raymond who recently departed EA. The wait to play Stadia will not be long as the service will launch this year in 2019 arriving first in the United States, Canada, United Kingdom, and most of Europe. Just how much does that service cost, we’re still waiting on that. It is a lot to take in but there is plenty of potential with Stadia. Google is not only targeting the player but developers as well and taking the hardware out of their hands is enticing. With this potential comes a lot of questions such as price and the variable speed of internet service in the US. Google is not dipping their toes into the water, they’re jumping in with a cannonball. Activision is bringing the real Call of Duty experience to mobile and not some Clash of Clans style game with the CoD name put on it. Packed with classic maps, characters and weapons from previous games in the series, CoD: Mobile will be a free to play title for both Android and Apple devices. The short trailer shown even gives glimpses at what appear to be zombie and battle royale (blackout) modes. A date for the release of Call of Duty on mobile has not been announced. Do you have some time to spend at Portia? My Time At Portia is coming to the PlayStation 4, Xbox One, and Nintendo Switch on April 16th. Pre-ordering the title will get you an exclusive outfit (jacket and ripped jeans), lion with wings statue, cuckoo station clock, rainbow jelly (consumable), dried beef (consumable), and a bag of gold containing 500 Gols. We have no idea what any of that means but it sounds good! It is no secret that Anthem has been under a bit of scrutiny since its launch and recently the endgame portion has taken quite a bit of criticism. Casey Hudson, GM of Bioware, took time to address the audience today in a blog that is self-aware of what is going on. While thanking players for tuning into Anthem, Casey does admit that Anthem “had a degree of issues that did not reveal themselves until we were operating at the scale of millions of players”. He goes on to state that the team is listening to feedback and is working on improvements to endgame loot and progression while also asking players to stick around “because the next stage is where things really get exciting”. Will players have the patience for Bioware and Anthem or will they move on? The tease last week of Castle Crashers coming to the Switch came true as The Behemoth announced today that their popular beat-em up is coming to Nintendo’s platform along with the PS4. With Castle Crashers Remastered comes the new “Back off the Barbarian” mini-game that appeared at the Xbox One launch while running the game at 60 frames per second. Oh, and all the previously released content is getting put into here as well. You better believe that the developers put HD Rumble into the Switch version and the PS4 version gets something cool too with the lightbars on the DualShock 4 reflecting your character affiliation color.